Food Costs > How Much Does an Ice Luge Cost? How Much Does an Ice Luge Cost? 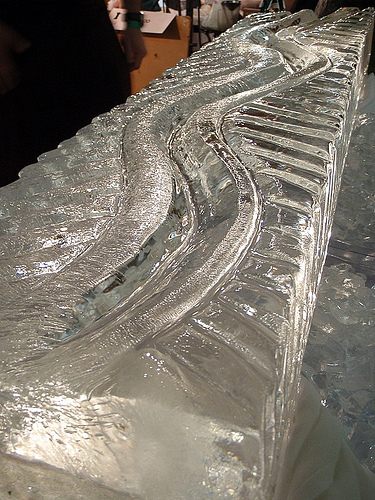 An ice luge is a large ramp of ice that can create various sculpted forms and has a narrow channel carved through it. At the top of the luge, the liquid is poured into the channel, and a few seconds later, the icy cold drink is dispensed at the bottom. When the liquid comes through the spout, it can be caught by a glass; however, when an ice luge is used at most parties, the liquid ends up falling directly into someone’s mouth. Typically, liquor is used as the drink of choice with an ice luge. Rather than pour a shot in a glass and drink it, the shot will be poured down the luge and caught in the mouth. On average, be prepared to spend anywhere from as little as $150 to as much as $350 for a basic ice luge. Larger customized sculptures can cost upwards of $700 to $1,000 depending on how many blocks are required. Companies often recommend budgeting at least $250 per half block. The costs will depend on how elaborate the ice luge is, the size and where it’s purchased from. For example, this smaller luge on Amazon retails for $15 to $40. LugeDoctor.com, located in New York, charges less than $100 for their sculptures. SculptedIceWorks.com charges $425 to $475 for their single block sculptures or up to $725 for customized company logos. An ice luge can come in all shapes and sizes; however, most will less than two feet will be able to sit on top of a bar and counter. This makes either drinking or catching the liquid more convenient than if it were on the ground. An ice luge can have one spout or multiple spouts depending on how large you make it and how many people will be using it. If purchased from a company, the ice luge will be wrapped in an insulated blanket to keep it cool for the next few hours. All the prices noted above usually do not include the cost of setting up. If you purchase the ice luge from a professional company and need it delivered and set up, there will often be an extra charge for this unless it was indicated it would be included in the price. This can add another $100 to $200 to the total price mentioned above. Lighting, which is often added to a display at a wedding, can be yet another expense added during the setup process. Depending on the amount of lighting, it could cost as little as $50 for a simple setup to as much as $200+ for an extravagant display. If creating your own ice luge, consider avoiding regular tap water for your ice sculpture molds as it may create a cloudy-like appearance. To create an ice sculpture as clear as possible, you should use distilled water. To leave space for the water to freeze, do not fill the ice sculpture mold all the way, but instead, around 90 percent of its volume. This way, the water will have enough space to expand when it freezes. Depending on the atmosphere, most ice luges will last up to six hours indoors. Plan on losing one-fourth of an inch per hour. Consider making your own luge. This is a great way to have fun and save money in the meantime. Even though they may not be as elaborate as one made by the professionals, it could save you a few hundred dollars.